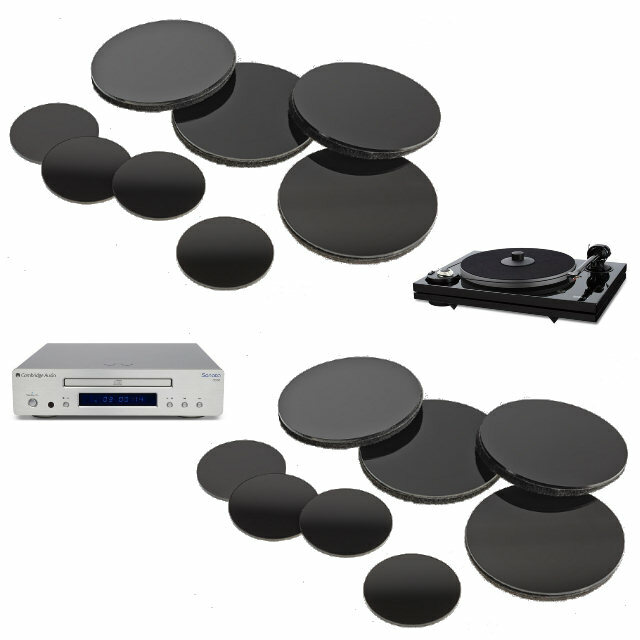 Quiescent Systems™ creates vibration isolation feet for specific audiophile components as well as products to enhance the functionality of isolation devices from other companies. 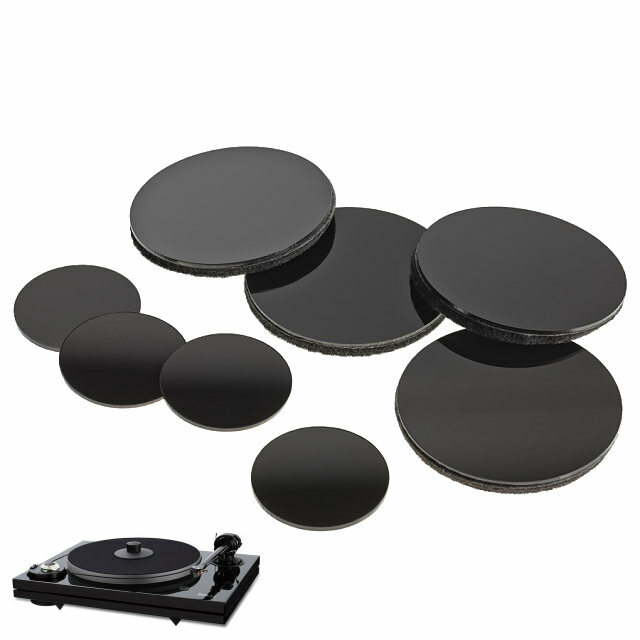 Selecting isolation feet for audiophile equipment has been simple. You divide the total weight of your component by 4 and then buy the isolation product based on its supporting weight range of each foot. You receive four feet that you place under your component and you are done. So, what could be easier? It is the rare component that has perfectly even weight distribution to each foot. In our testing we have never seen anything close to equal distribution. 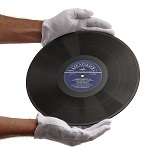 What's more it is typical for the load to vary by a factor of 5 or more between the feet. The result is isolators supporting loads outside their functional range. Because of isolator compression variations your valued component is no longer level. In the end it may be that you have done more harm than good. 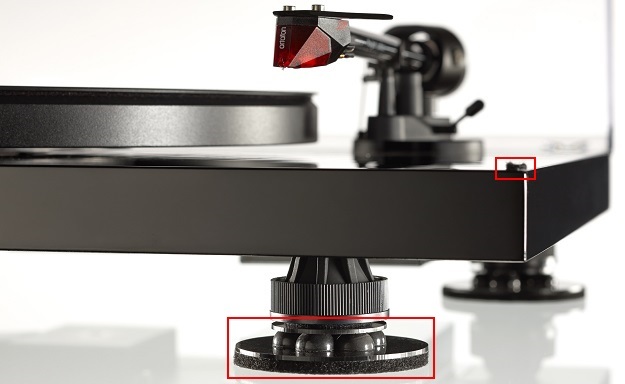 Once we decide to create a set of isolation feet for a particular audio/video component we first analyze how the load is distributed to each foot of the component. We then begin a rigorous series of prototyping and validation. Some of the design and test criteria include. 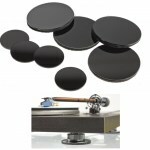 The result of our design work can be seen in our isolation set designed for the Pro-Ject Debut Carbon turntable. There are over 30 separate components combined to make the 4 individual multistage isolation feet. Each isolator is designed to work with a specific component foot. Meaning that the left front isolator will not work properly if placed at the left rear. In addition two extra felt pads are included to dampen the transient shock of closing the dust cover, granted this is a small item but is indicative of our attention to detail. 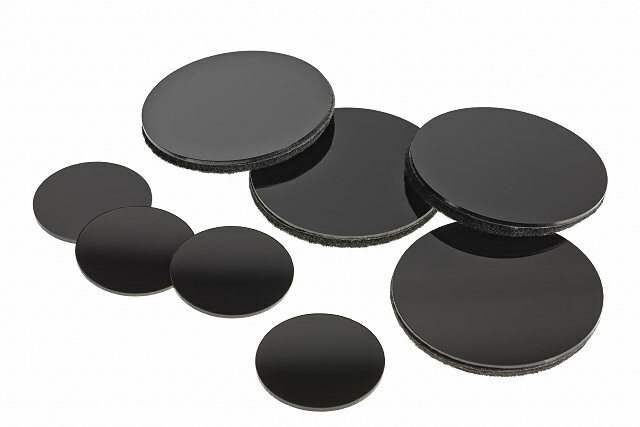 Sorbothane is a well-regarded polymer material that is found in many vibration isolation products. 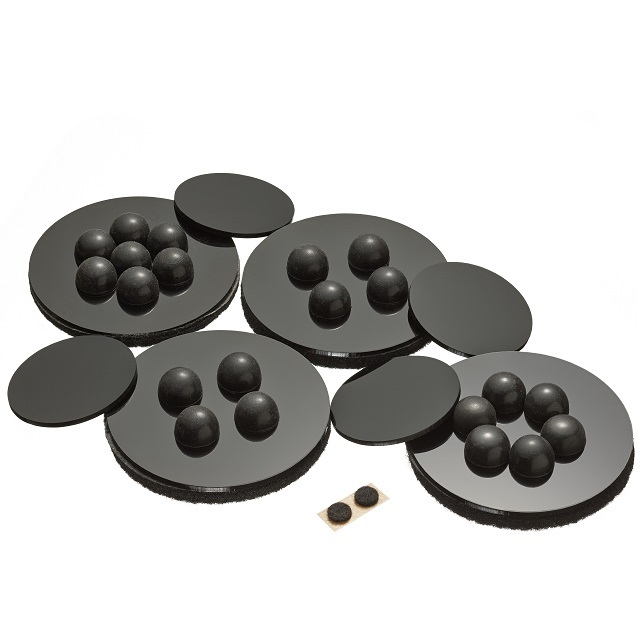 Often users are unaware that Sorbothane contains chemicals that will stain paint, wood, various wood finishes and just about any other material that they contact. Often this is learned too late. One way to protect the finish is to use a piece of plastic under the Sorbothane isolator. 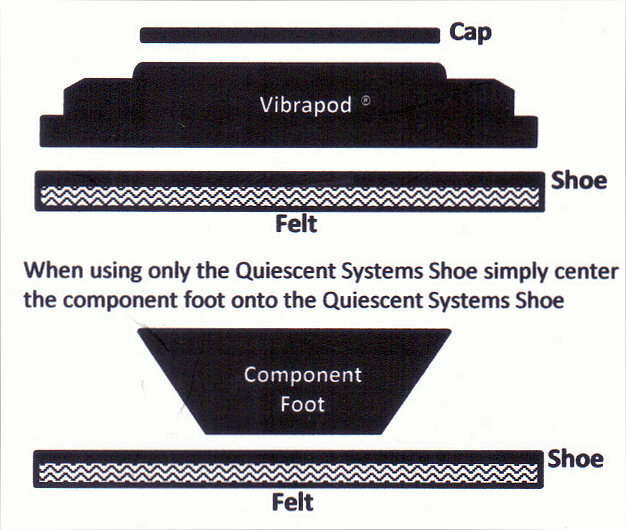 A better method is to use Quiescent Systems Shoes to place under the Sorbothane. Quiescent Systems Shoes are 2 ½ inches (6.35cm) in diameter. The top is acrylic and the bottom is industrial vibration absorption graded blended felt. By placing the Quiescent Systems Shoe on the shelf (or bottom component) and then placing the isolation product on top of the Quiescent Systems Shoe you get protection from chemical stains common with Sorbothane and also improve the effectivness of the isolation device. Below is a brief list of isolation devices that work with the Quiescent System Shoe. This list is by no means comprehensive, many other isolation devices also benefit from use with the Quiescent Systems Shoe. Always insure that the isolator or component foot diameter is 2 ½ inches (6.35 cm) or less so that it fits on the Quiescent Systems Shoe.